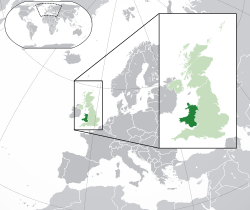 Rwiyo: Hen Wlad Fy Nhadau, "Land of My Fathers"
Wales (/ˈweɪlz/, muChiWelsh: Cymru [ˈkəm.rɨ]) inyika iri muUnited Kingdom. Nyika iyi ine miganhu neEngland neIreland. This page was last edited on 17 Chikumi 2018, at 13:39.